Hispanics are an overriding force in homeownership, flouting national figures as they establish owner households at a rising rate for the second straight year. According to the National Association of Hispanic Real Estate Professionals’ (NAHREP) recently released 2016 State of Hispanic Homeownership Report, the Hispanic homeownership rate increased to 46 percent last year, leading an against-the-trend charge in spite of a decreasing national rate. The Hispanic homeownership rate was 45.6 percent in 2015 and 45.4 percent in 2014. In addition, more than 7.3 million Hispanic households owned their homes in 2016, with 330,000 new households added—38 percent of all households formed. 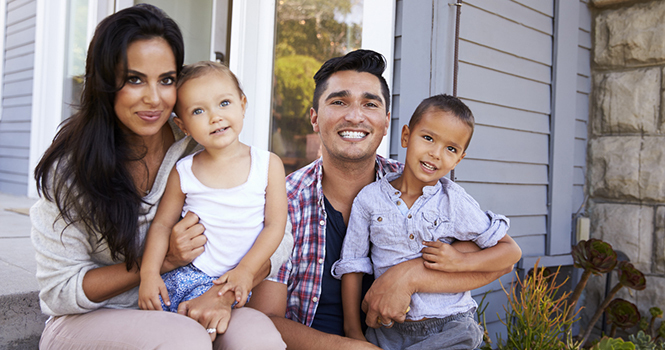 What drivers are compelling Hispanics toward homeownership? Owning a home, for one, remains a hallmark of their American Dream. The majority of Hispanics view homeownership as a viable investment vehicle for wealth-building, as well as ideal for child-rearing. More members of the industry, secondly, are working to meet the unique needs of Hispanic homebuyers, especially in terms of financing. “While the Hispanic market has outgrown the ‘niche’ segment designation, the housing industry is just beginning to fully recognize its significance to the vitality of the overall market and is responding with products and services that are more relevant to the needs of Hispanic consumers,” states the report, citing recent initiatives helmed by Bank of America, Fannie Mae and Freddie Mac, and Wells Fargo. Financing, still, is a hurdle. Hispanics were denied mortgages at a rate of 17.3 percent in 2016, approximately nine percentage points higher than the rate for non-Hispanic whites. Sixty-seven percent of Hispanics believe it is “difficult” to obtain a mortgage, limited by an inability to afford closing costs and a down payment, or lacking credit—characteristics typical of first-time homebuyers, of which roughly half are Hispanic. Twenty-seven percent of Hispanics, notedly, have no credit score. The obstacle could be chipped away with the addition of more “culturally competent” members of the industry—another impediment to Hispanic homeownership. Only 7 percent of real estate agents and 4 percent of mortgage professionals are Hispanic; 25 percent of Hispanics, however, would prefer to work with a Spanish-speaking agent. Many professionals, also, are unware of Hispanic cultural norms. Another potential headwind? Policies by the Trump Administration that could sap the Hispanic segment—namely, a mass deportation effort and a wall between Mexico and the U.S. Hispanics comprise two-thirds of the undocumented population in the U.S., and the undocumented population makes up 15 percent of the construction workforce. Cutting that contribution through mass deportation would be harmful to housing, according to NAHREP. Deportation has an ulterior effect, as well: more foreclosures. “[A study shows] a detrimental synergy between deportations and foreclosures, which could result in prolonged stagnation of the housing market in areas with high immigration enforcement policies,” the report states. As for the wall, NAHREP proposes that “the federal government…focus its efforts on comprehensive immigration reform strategies which would constitute a more effective use of $21.6 billion than a border wall,” recommending a multipronged approach involving deportation relief, immigrant and non-immigrant visas and a path to citizenship. For real estate professionals, Hispanics represent a sustainable, vast opportunity. Ninety percent of Hispanics would prefer to own a home than rent one in the future, and 62 percent are more likely to buy a home than rent one for their next move. In 2016, Hispanics had a purchasing power of $1.4 trillion—a number that will continue to compound as incomes and Hispanic-owned businesses grow.